Last Updated: March 19, 2019 · Published: August 8, 2016 By: Asian Caucasian Leave a Comment This post may contain affiliate links or sponsored content. Now, I don’t eat a lot of meat, but I couldn’t wait to get in the kitchen with Damien to prep for this delicious Asian flank steak! The marinade is heaven, the meat grills up quickly and is melt-in-your-mouth tender! 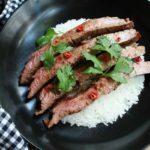 Lay it over a nice bowl of steamed jasmine rice and you’ve got one amazing steak dinner! Let the meat rest for at least 10 minutes before slicing. Place whole flank steak into a large Ziplock plastic bag. Set aside. In a small mixing bowl, combine soy sauce, rice vinegar, fish sauce, garlic, ginger, chili peppers, sugar, lime, and canola oil. Whisk until blended well. Reserve ¼ cup of the marinade. Pour rest of mixture over the flank steak. Seal the plastic bag, massage marinade into the steak, and let it sit at room temperature for 30 minutes. Meanwhile, heat an outdoor grill or grill pan on high heat. 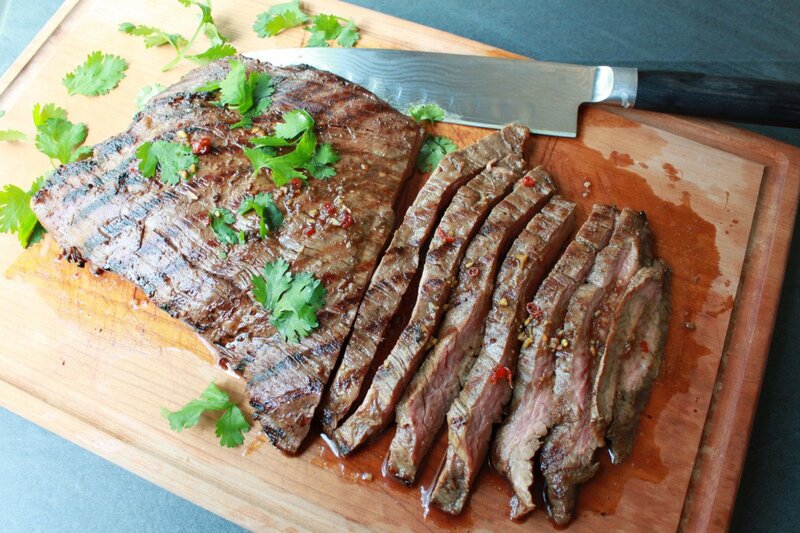 Grill the flank steak on both sides about 8 minutes per side for medium doneness. Remove to a cutting board and let rest for at least 10 minutes before slicing. Heat remaining marinade in a small sauce pot until slightly reduced. Place steak over jasmine rice, pour remaining sauce over steak, and sprinkle with fresh cilantro.